TV Friends is an application by which you can chat with people who watch the same TV Program. No user registration, and it’s free to use. Download TV Friends from here. Enjoy the World Cup Together! During the World Cup is on going, a new category called “2018 FIFA World Cup” is added to TV Friends! 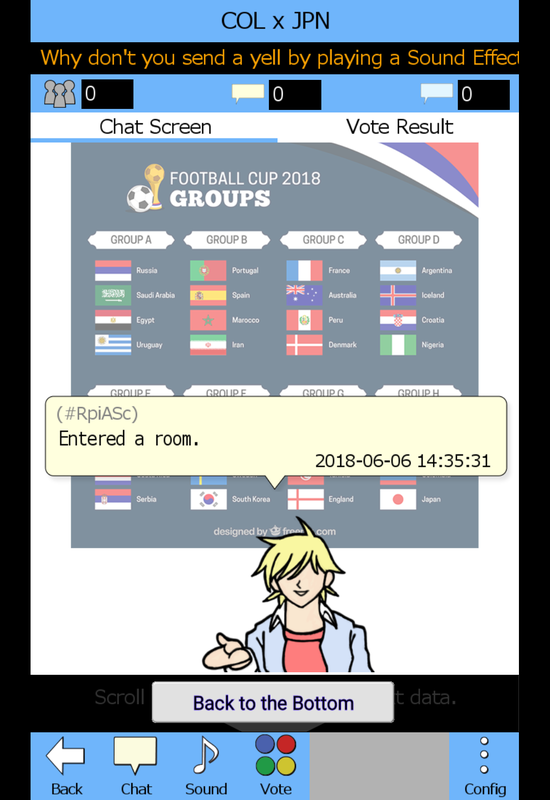 TV Friends basically has chat rooms per TV Station basis, but for the World Cup, chat rooms per “Match” basis is applied taking out Country/Region or TV Station basis rules! Select “2014 FIFA World Cup” on the Country/Region selection screen. Select “Match Date” on the Area Selection Screen (*), “A Match” on the TV Station Selection Screen, and then, “A Room” on the Room Selection Screen. Finally, you can enter a special chat room designed for the World Cup (**). In the room, a special wall paper will be displayed. Let’s cheer your team watching TV match! (*) If you select “Japanese” on the Language Selection Screen, the “Match Date” will be shown as JST. If you select “English,” the date will be shown as Russia timezone (more precisely, each stadium’s time zone). Supporters from all over the world can enter the same chat room. You should cheer up your team hardly so that it won’t be beaten(*). Why don’t you decide the side from where you send a yell? How about the left if your team name is displayed at the left of the room name (the right if it’s noted on the right side)? 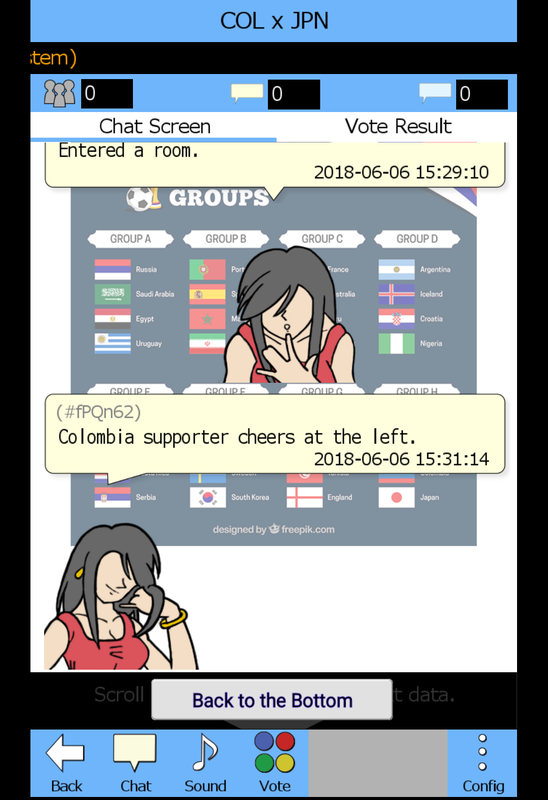 Example: In the case of “COL x JPN,” Colombia supporters cheers at the left side, and Japan supporters send a yell at the right side. 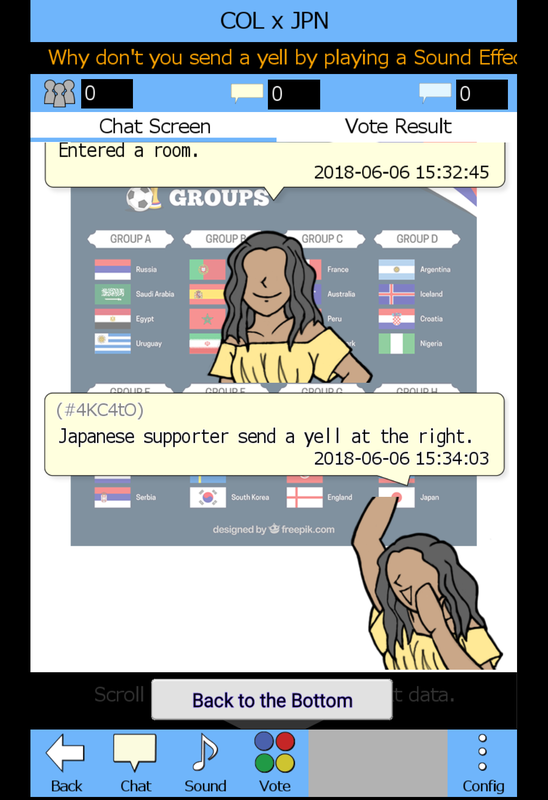 (*) Different teams’ supporters who uses different languages will be in the same room. Even so, you must be a fair player as 12th starting member of your team. TV Friends has preset sound effects. You can open a list of the sound effects by pressing Sound Selection Button on the main menu, and then select a sound effect you like, then press “Send” to bloadcast. Why don’t you use the following Sound Effects? 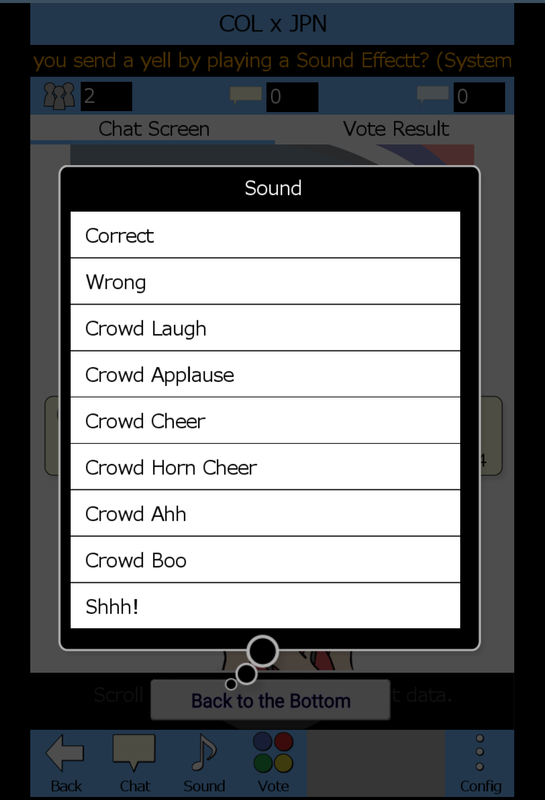 Of course, you can cheer by chat. 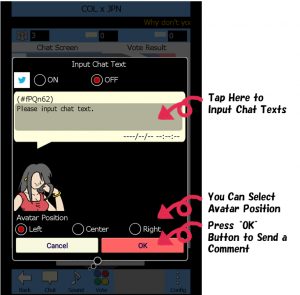 Chat Text Input Screen will appear by pressing Chat Comment Button, and then, tap a chat bubble to open text input UI. 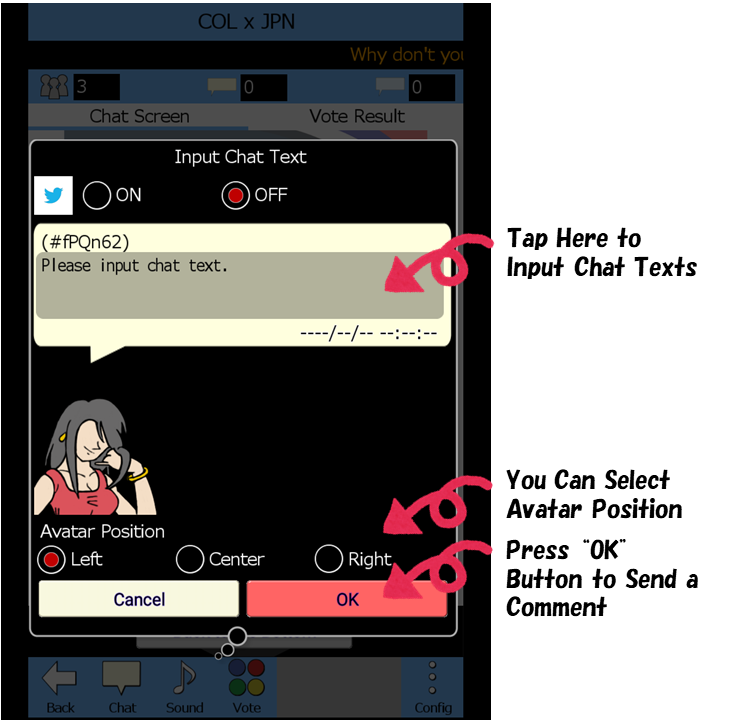 When you finish inputting texts, choose avatar’s position, and then press “Send” button to post a chat comment. Together, let’s go hot when a moment of a goal! Please refer Help page for deeper explanation of the usage. This service will be provided only the World Cup is open (2018/06/14 – 2018/07/15）. As TV Friends officially supports only “Japanese” and “English,” there will be languages which cannot be displayed on the chat screen. Relating to the above, to use TV Friends, you must be 18 and more years old, and must accept “Japanese” or “English” end user license agreement. World Cup chat rooms have Twitter hash tags with abribiated country/region names for each match.